Yesterday was 'Crazy Hair Day' at my daughter's elementary school. Ever so often her school has a random fun activity. 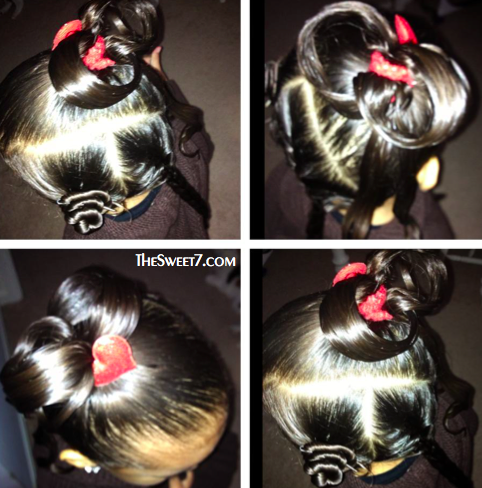 Since it was a last minute decision as to the exact hair style for crazy hair day, she allowed me to go bonkers! I knew she looked 'crazy' the minute we stepped out the house, and I hesitated to walk beside her, thinking people must think me crazy to let my child out of the house like that. Anyway it was in jest! And a quick walk to the bus stop and with a rather frigid temperatures, I used her hoodie to cover her hairstyle while we waited for her school bus. The best part of her crazy hair day was her class' reaction to her crazy hair style, captured and retold in the video below. This cracked me up. Enjoy! 1. I used an empty toilet paper roll and gel to shape the top half to look like a bow. 2. A bantu knot, when I grew up in St.Lucia, I called it a 'papilliot'. It was a style my mom did for me when I was a little girl, and ever so often I still may comb my hair that way at home. 3. A French braid which my daughter and I refer to as the 'dinosaur' since her school friends are always fascinated with it.